Not far from Eugene, high in the rugged, remote mountains in the southernmost reaches of Oregon’s Lane County, take a hike through history. 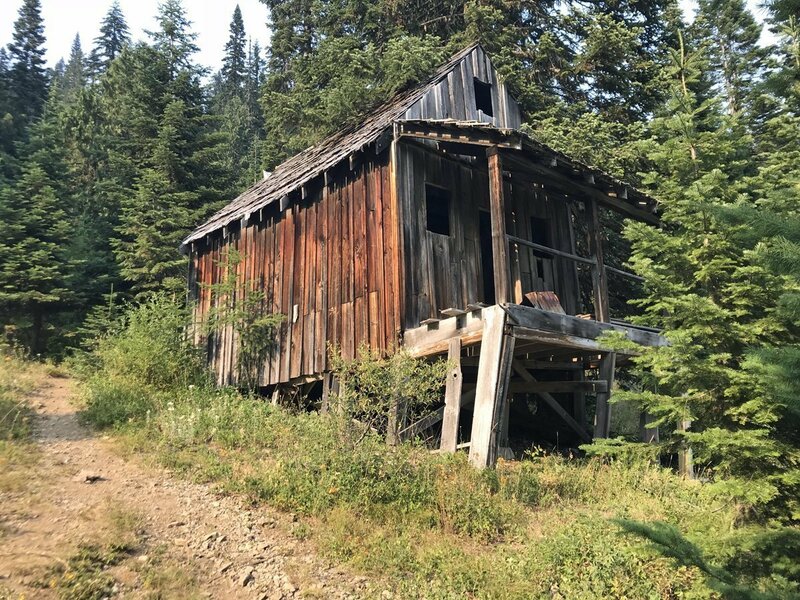 The Bohemia Mining District east of Cottage Grove reveals buildings, equipment, and the hopes and dreams of men 120 years ago. A time when gold mining in Oregon could make a man rich, and the treasure was there for the taking. Bohemia City’s post office and store, built in 1893. On our visit in 2018, it still stands, but the land is trying hard to reclaim it. Musick Mine, named for James A. Musick, was one of the largest and most profitable gold mines from 1890 to 1910. It was also the site of Bohemia City. By 1903, they had electricity carried by lines to the “Warehouse” at Lund Park. Besides the post office and electrity, Bohemia City also boasted saloons, a sawmill, a county clerk, blacksmith, boardinghouse, and residences. Musick Mine is located on Bohemia Mountain, near the saddle between Bohemia Mountain and Fairview Peak. Other mines dot the region, and roads crisscross both mountains in a maze of 100-year-old mining activity. Today, most of the mines are long closed and blasted shut. A few, though, are still active claims, so if you go to explore, be sure to look for the No Trespassing signs. Now considered a ghost town, Bohemia City is a shadow of its former glory. Musick Mine is open to the public for hiking and exploring, thanks to the Bohemia Mining Association that maintains the property as much as they’re allowed. Here’s the thing about Musick Mine…the road goes all the way into the heart of the mining property, right up to the post office and even beyond. BUT, you have to have a 4-wheel-drive with high clearance. We have a minivan. A minivan. We hiked. Since we were staying at the nearby Musick Guard Station, we drove up the spur road near the cabin until the road got too rough for our van. We found a wide spot in the road and parked. Of our 6 kids, ages 0 – 13 years, four could hike pretty well, the fifth hikes but doesn’t have much endurance, and the sixth wasn’t yet walking. We used a Deuter Kid Comfort II frame pack for our 5-year-old, and I wore our baby in a standard Tula carrier. The road into Musick is pretty good, but it was built from fist-sized rocks. Any dirt or sand between the rocks has long since eroded away, and the rocks form a very uneven surface and tend to roll underfoot. This was easily walkable for the adults and older kids, but our younger kids needed some assistance and we held hands just to keep them from tripping every third step. The road looks great here, but there are spots impassable for low-clearance vehicles, including our van. Thankfully, the hike in is pretty short and we had some great views of Bohemia Mountain. The peak of Bohemia Mountain. Note the bright spot in the middle of the photo. This is the upper tailings pile for the Musick Mine’s higher entrance. From our wide spot, where we left the van, to the mine was only about 1/3 mile. The mine welcomed us with a view of the post office as we came around a bend in the road. The post office was built in the 1890s and has been somewhat maintained by the Bohemia Mining District Association members. They’re allowed to keep it standing, provided they do no major improvements to the building. The post office is the last major building left standing at Bohemia City. We took photos through the open back door. The floor looks solid, but I chose not to test it myself! The terrain around Musick Mine is often steep and treacherous, and decades of mining have left enormous piles of mine tailings, or leftover material dug out of the mountain. Sprinkled about the tailings piles are remnants of equipment and former buildings. A water pump tower is still standing at the edge of the tailings. We poked around carefully and let the kids explore a bit. For the most part, it’s pretty safe for kids. We didn’t see any sharp edges or anything inherently dangerous. There were a couple of bloodied knees from falling on all the loose gravel, but everyone was having too much fun to complain. Musick Guard Station, just around the corner from the mine, has an in-depth history of the Bohemia Mining District. That book describes this building as a tower holding a water tank. I haven’t found any mentions otherwise, but if I’m wrong, do write to me and let me know! Inside the water tower at Musick Mine. Photo credit Camille. Perhaps the coolest feature of Musick Mine is the tramway rails. These lead straight out of the mine entrance, across the top of one tailings pile, and end before the tailings pile drops off to nothing. It’s easy to imagine ore carts filled with tailings (or slag…waste rocks) rolling out of the mine entrance. The tracks are about 18″ apart, and twisted bits of track lay scattered at the bottom of the tailings piles. If you could stand on these tracks, and then turn around, you’d see the lower entrance to Musick Mine. It’s blasted closed, and full of debris, but the air near the entrance is noticeably colder (especially on a hot August day). I can so easily imagine this being a beehive of activity 120 years ago, with men working, metal clanging, the ore carts rumbling, and the occasional blast shaking the mountain. We kept the younger kids away from here, as many of the boards had rusted nails poking out. Our bigger kids explored carefully, and marveled at “what used to be”. From the road as we hiked in to Bohemia City and Musick Mine, we saw a tailings pile higher up on the side of Bohemia Mountain. What was that? Is there another entrance?? Can we get there? Behind the entrance above, there was a very rough, very steep road. We had plenty of time, and we wanted to see as many mines as possible in our three days, so up we went. Road from the lower Musick Mine to the upper mine entrance. There’s also a road coming down from the Bohemia Mountain saddle. All are steep and very rough. Tailings pile at the upper Musick Mine entrance. Upper Musick Mine entrance. Keep Out! The cold air wooshes down this little hill to blast you in the face. I did venture closer, very carefully, so I could see inside. The entrance is blasted shut, but a rock thrown in rolled quite a ways so we kept our distance and didn’t let the little ones anywhere near. They stayed below on the tailings pile. The cold air coming out was constant and refreshing. Hiking around in the brush near Musick Mine yields a few more discoveries. This outhouse is about 50 feet away from the water tower. It was at some point moved from its original location (the round cement pad with the square hole). Whether this was by vandals or by miners, I can’t say. A mangled metal toilet remains inside the outhouse. There’s beauty, too, amongst the fallen remnants of the mine. Flowers abound around the edges, in purple and white and brilliant red. Even on the tailings piles, we found tiny succulents blooming. From Interstate 5 in Oregon take the Cottage Grove exit 174. Take Row River Road 2400 east for 19 miles to Brice Creek Road #2470. Keep right and continue on Brice Creek Road for 12 miles to Noonday Road 2212. Turn right and travel for 8.8 miles to Champion Saddle. Keep to your left, traveling on Sharps Creek Road 2460, for 0.4 miles to a spur road on the left. This road is very rough and high clearance vehicles will be required. There are several alternative access routes to the Musick Mine. Please contact the Cottage Grove Ranger District during regular office hours for this information as well as current road conditions. Map to Bohemia Mountain Mining District. 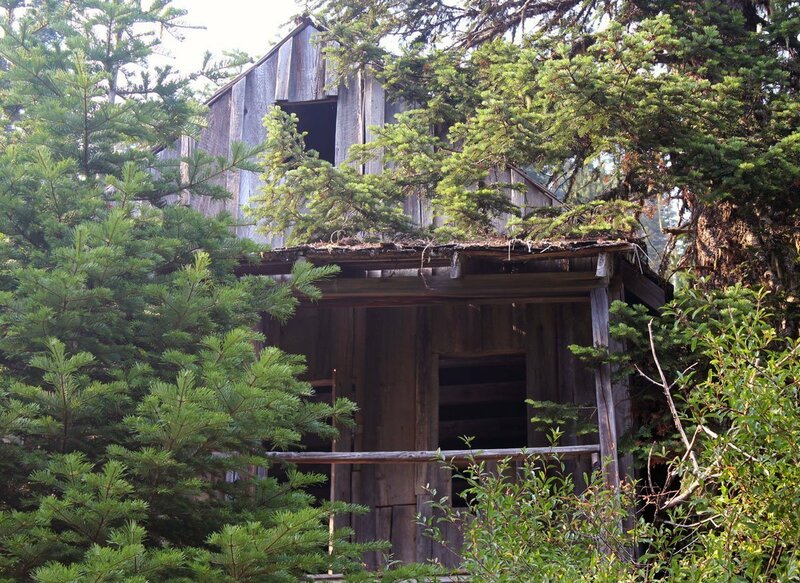 Explore the history of gold mining in Oregon, and hike the Bohemia Mountain Trail. 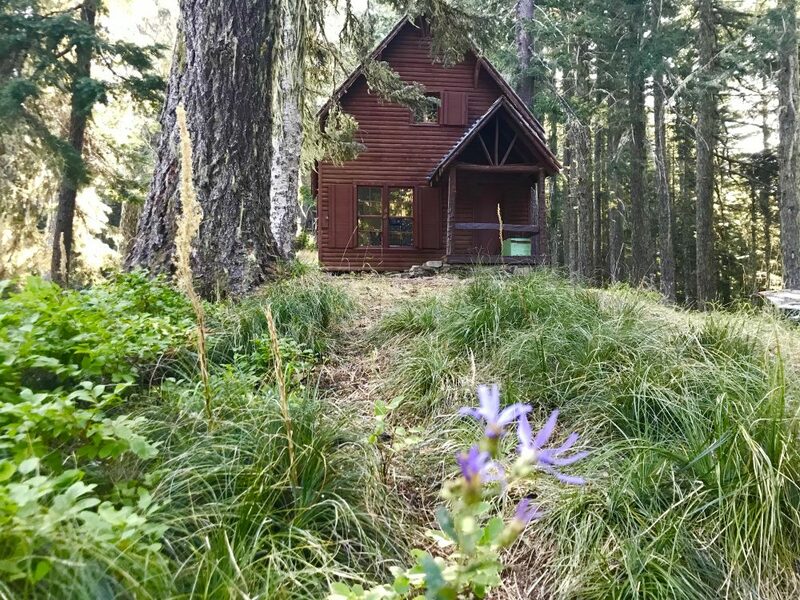 Bohemia Mountain is easily done as a day trip from Eugene or Springfield, but if you’d like to stay on the mountain and really explore, there are a few choices for accommodations. The Musick Guard Station was our choice. It’s a historic, 1934 fire guard station location very near to Musick Mine. It’s rentable through the Forest Service via Recreation.gov. If you’d like to rent this, book it early, like February or March, as bookings fill up fast. Musick Guard Station is a fun place to stay with kids. The cabin is safe for all ages (block off the stove with benches provided) and there are several small trails and outbuildings to explore. A vault toilet is provided, but there is no water or trash service. If camping sounds like fun, there are several campgrounds along Brice Creek Road. We stayed at Lund Park, which is not able to be reserved, but mid-week we were almost the only ones in the campground. 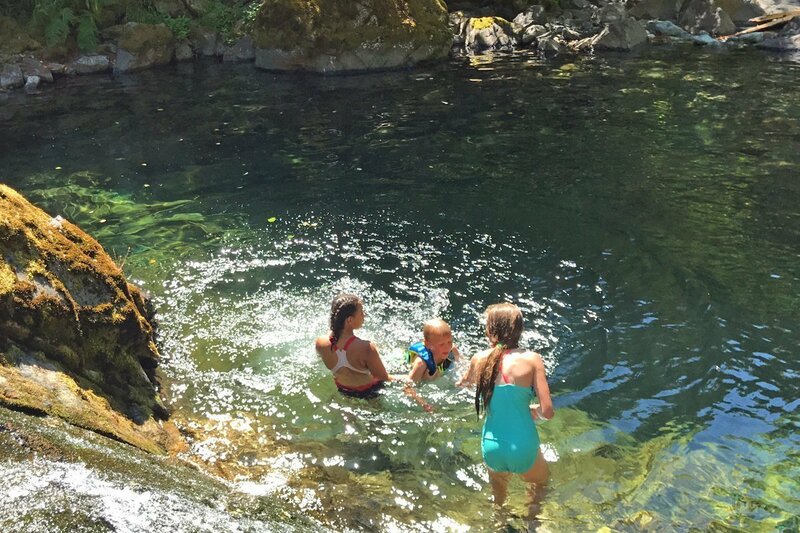 Hobo Camp is also nearby, which has amazing swimming holes. Swimming hole between Lund Park and Hobo Camp. Safer swim areas are nearby for younger kids. You can pitch a tent at Bohemia Saddle, but there are no amenities here, neither bathrooms nor picnic tables. Everything is pack-in, pack-out. Several homemade fire rings are scattered about, and areas cleared for tents. Besides Musick Mine, there are mines dotted all over the mountain. We also found Vesuvius Mine, which is worth the short trip to see. The Bohemia Mountain Trail is well-known for being a beautiful hike that rewards you with incredible views, and on clear days they say you can see Mt Shasta in California and Mt Hood in northern Oregon. We didn’t hike it on this trip, but we’d love to return just to do this hike. Fairview Peak, which shares the saddle with Bohemia Mountain, has a lookout on top that is still manned during fire season. The gate is probably closed, but you’re allowed to hike up to the peak and see the lookout. The lookout used to be rentable during the off-season, but due to structural issues it’s no longer available and they don’t know when, or if, it will be rentable again. And tons of hiking. With roads crisscrossing all over the region, pick one and hike! There are also established trails near Brice Creek, many leading to waterfalls like Trestle Creek Falls. I highly recommend stopping at the Bohemia Gold Mining Museum in Cottage Grove. It has limited hours, but if you can swing a visit, DO! The entrance fee is a donation, and it’s staffed with experts who’ve spent their lives tromping around on Bohemia Mountain. They have a collection of mining artifacts that are fascinating and help you envision how the mines were run and what life was like on Bohemia Mountain. 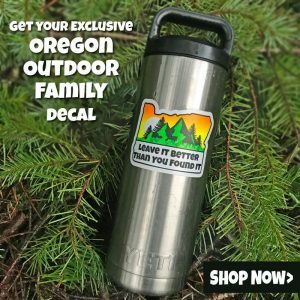 Their history of gold mining in Oregon is unsurpassed, and I recommend at least an hour to look through the museum and browse the small gift shop. My kids are insisting I include this story. It was NOT funny at the time, but now we have a pretty good laugh, remembering our panic. We were nearly done exploring Musick Mine, and I was taking some last photos before we started the hike back to our van, when I heard the unmistakable sound of a car alarm. Two things dawned on me simultaneously: we’d been up here for two days and hadn’t seen a single car or person, so it had to be our van’s alarm. And we were 1/3 of a mile away. Panic hit us, and we gathered up the kids and started off as fast as we could go. The alarm stopped after about 30 seconds, but we knew that whoever had set off the alarm would have at least 10 minutes to themselves before we could get there. Nothing. It was fine. Phew! Later, we arrived back at the Musick Guard Station where we were staying, and found that a forest ranger had been there to hang a fire ban notice. We realized it was probably his car alarm, not ours. But for 10 minutes, we imagined the worst and our adrenaline raced in a futile attempt to save our van. Did you like this post? We’d love a share! Wow so cool! I grew up in Eugene but have never heard of this hike. Can’t wait to bring my kids to it!